When setting out your feeding programme it is important to consider the time of year along with the workload and status of your horse. Writing for our 20th anniversary magazine, The Inside Scoop, Ashley Neely examines what we should be doing to look after our horses this autumn. During the autumn months the grass quality slowly decreases and it is important that we take this into consideration. Additional calories may be required for some horses to maintain weight and condition as the quality of forage declines.Ideally alternative sources of energy and calories rather than cereals are desirable, such as the use of super fibres such as soy and beet as well as oils and fats. Along with energy levels, the nutrient content of the forage will also decline and therefore additional supplementation is often required. This may be fortified within a feed or via a balancer such as Stamm 30. During autumn our attention also turns to our breeding stock as weaning begins. 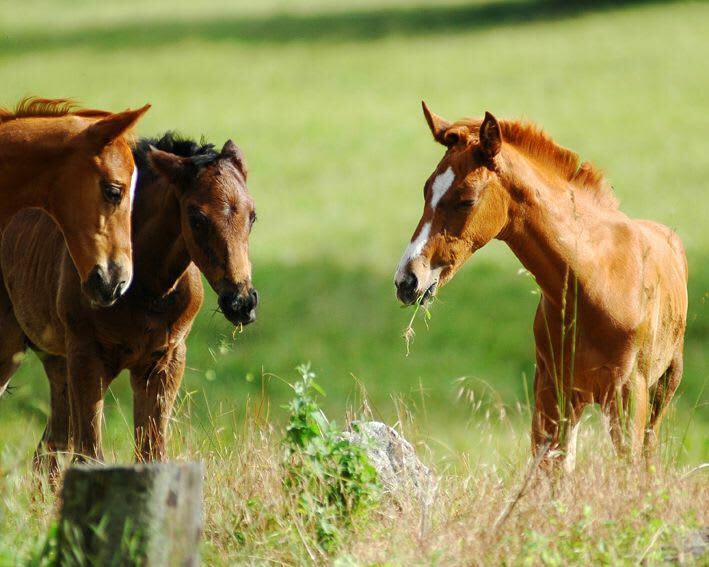 The weaning process has been reported as one of the most stressful events in a horse’s life. Nutritional mistakes at early life stages can lead to structural problems that may limit performance potential. During weaning, excess energy is used and a temporary period of decrease weight gain can be observed. Inadequate nutrition to the weanlings has shown to be associated with higher risks of Development Orthopaedic Diseases (DOD). According to The National Research Council (NRC) Guidelines, foals gain an average 0.8kg per day. A diet must meet or exceed to NRC recommendations for energy, protein, calcium and phosphorus. A forage only diet for growing foals is unlikely to meet these requirements as forage is a low source of lysine, an essential amino acid for growth. Most foals are gradually introduced to concentrates through eating small amounts from the mares feed. Weaning for mares is not considered to be as stressful, particularly those which have previous offspring. However, attention should be given to the nutritional changes required by the mare. Some may be pregnant during the weaning process and therefore it is highly important to ensure nutritional imbalances do not occur. The absence of concentrates during weaning can result in a slow down of milk production. Decreasing milk production as quickly as possible will keep the mare comfortable and reduce the risk of health issues such as mastitis. Providing high quality forage until milk production ceases should be sufficient in most cases, for those that struggle with condition, the addition of a balancer, such as Stamm 30, would be beneficial. A correct and structured nutritional programme is key to ensure your horses' condition does not decline with the poor-quality forage. Providing a sound feeding programme for horses at all ages and workloads ensure they are receiving the correct nutrients needed for growth, performance and recovery.